Is Management Hurting or Helping Sales? There’s still time to register for a webcast I am doing today, Dec. 10, at 11 AM PST. 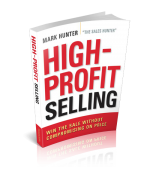 It is titled High-Profit Selling: How Leaders Impact Their Teams’ Success and I will be discussing at length what management can do NOW to stop blocking sales and start creating sales. It’s time we get serious and begin to realize too frequently management is standing in the way sales. When management is more focused on measuring data, verifying reports and all of those things managers are guilty of doing, is it any wonder salespeople view their managers as blocking sales? The role of the manager is not to be a manager but to be a leader in helping to develop new sales opportunities. Problem is most managers are clueless with how to do it. They feel the best way to do it is to jump in and help the salesperson close the sale that is about to slip away. What managers fail to realize is despite how important this activity might seem, it actually serves to undermine the salesperson and the customer relationship. When a manager has the “sell the sale, make the close” attitude, it is endemic of a much larger problem and it’s not with the salesperson, it’s with the manager. The role of management is to be engaged earlier in the sales development process. Being engaged earlier is a 180-degree shift from what the majority of managers are used to doing. What % of the customer calls you make with salespeople are focused on uncovering new opportunites vs closing a sale? Can you identify strategic new sales opportunities you’re uncovered for your sales team? These two questions separate the vast majority of managers. The % of sales calls that managers make that are designed to close a sale is typically 2 to 1 or even 3 to 1 vs uncovering new opportunities. When I probe with a manager, the quick response is they don’t want to be tagging along on the first call a salesperson makes with a customer. The feeling is that doing this doesn’t allow the salesperson to be seen as the one in charge. I get it, and I’m not saying for any manager to undermine a salesperson in this way. What I’m talking about is joining the salesperson on a sales call during the middle of the sales process. Doing so allows the manager by nature of their position to gain information the salesperson may not have been able to uncover. Joining the account manager when doing a business review with an account is another great opportunity the manager must be taking advantage of. Don’t view what I’m saying as only suitable for the sales supervisor, because these suggestions are just as applicable to every level of management. From my own experience, I’ve found the benefits gained when the President, COO, or even CEO is involved are typically even greater. This is especially true of being able to uncover new sales opportunities. Join me today, Thursday, Dec. 10, @ 11 AM PST for High-Profit Selling: How Leaders Impact Their Teams’ Success and I will be discussing at length what management can do NOW to stop blocking sales and start creating sales.